I viewed the ministrations of the professional carers of the ‘gyn’ ward a shade truculently at first. The world expert on her own body did not take kindly to others’ interference. They related to me as a physical body, a condition which had an associated set of procedures for its care repair, maintenance and recovery. In my post-operative condition, however, total surrender came easily. They knew how I should be and move, what I should consume and expel more than I did. They instructed and I obeyed dutifully and gratefully as, like an infant, they coached me as I relearned basic bodily functions. They helped me vomit, cough, ablute, eat, drink and laugh; they supported me as I rose and walked my first faltering steps – terrified that my tummy would fall out! Total and willing submission to that gentle tyranny was swift. With humour, patience and wisdom, I was tenderly trapped! These daffodil ensignia-ed carers were, at first, anonymous in their shades of white and grey, yet sensitively objective. Odd contradictions lay in this unremitting, bewildering and efficient parade of professional women in cardboard hats: they were intimately distant, humanely detached and generally particular. The egalitarian regime inspired confidence with its punctuality, competence and coordination. My fellow (!) patients, freed from worldly responsibilities, were united in the sisterhood of biology and by the levelling power of gynaecology. The old hands looked benignly on as novice admissions were daily integrated into the post-op hierarchy: from helplessness, starvation and pain through assisted feeding and movement towards autonomous mobility, cleanliness and wellbeing. Progress was slow but the days were obligingly long. The outside world gradually faded in the post-anaesthetic haze. Partners and husbands coped or they did not, motherless and fatherful children pined or enjoyed the change. The world went on, somehow, beyond this drowsy hermetic regime. Slowly, the human beings emerged from the bedsheets and the uniforms as the ward became our main reality. Friends, parents, husbands, children and lovers alike adjusted their orientation to this new locus. Intimacy deepended in the inner sanctum amidst the shared experience of female reproduction and its ramifications. All the miracles of human existence were certainly there: love and fear, life and death, birth and reproduction, hysteria and tragedy, fertility and sterility – powerful forces working through indomitable spirits. Kindly males among the physicians, technicians and porters, granted almost honorary status, were sporadically escorted in and out, excluded from that deeper understanding shared by the female miracle workers: carers and cared for alike. The nomenclature of that ward, ‘doll’, ‘pet’, ‘hen’, ‘love’ , ‘darling’, when used by women to and of women lost the condescension often felt when uttered by men. There is a need for specialised, segregated female health care. Wards like these provided solace and strength where women could heal and recover alongside other women. That their biology creates a bond between women is undeniable. 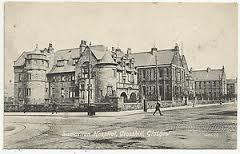 Glasgow Royal Samaritan Hospital for Women closed in October 1991 – it’s spirit, staff and patients absorbed into the mainstream of acute services in the city. Its closure was counter-intuitive as its approach to women’s health remains ahead of its time.